Today, I want to write about the dalmatian pelican because they have a cool hairstyle and beautiful bills. The largest of the 8 pelican species, the dalmatian pelican is also possibly the heaviest flying bird in the world. They can grow to up to 180 cm long, weigh up to 15 kg and have a wingspan of up to 3.5 metres. They also often have a really funny looking set of feathers on top of their head that looks like they are wearing a wig. They swim around lakes and rivers, using their massive bills to catch fish and then dump the water from the sides of their pouch before swallowing their meal. Their large pouches have caught fish that have been measured at up to 50 cm long. Dalmatian pelicans build big clumsy nests on the ground or in low areas on islands or on floating vegetation. Their nests are about one metre across and they lay 1-6 eggs, although 2 is normal. Once found throughout southern and eastern Europe and Asia, these magnificent pelicans have dropped in numbers and are now sadly considered vulnerable to extinction due to habitat loss and hunting. Thankfully there are efforts to build nesting platforms that may provide protection for them and hopefully they will increase in numbers again. 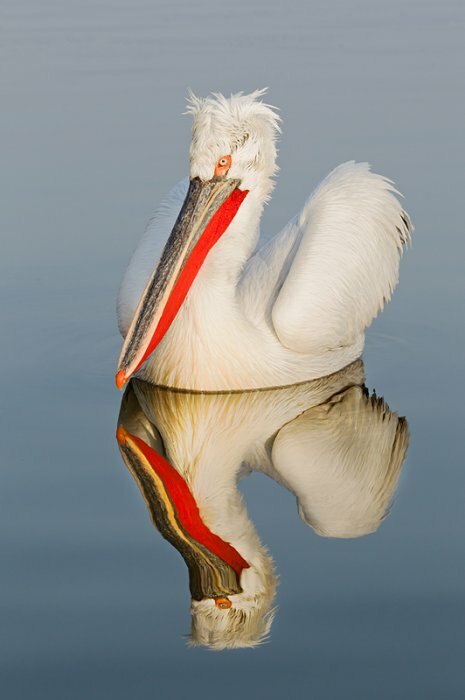 Are there any other interesting facts that you would like to share about dalmatian pelicans?